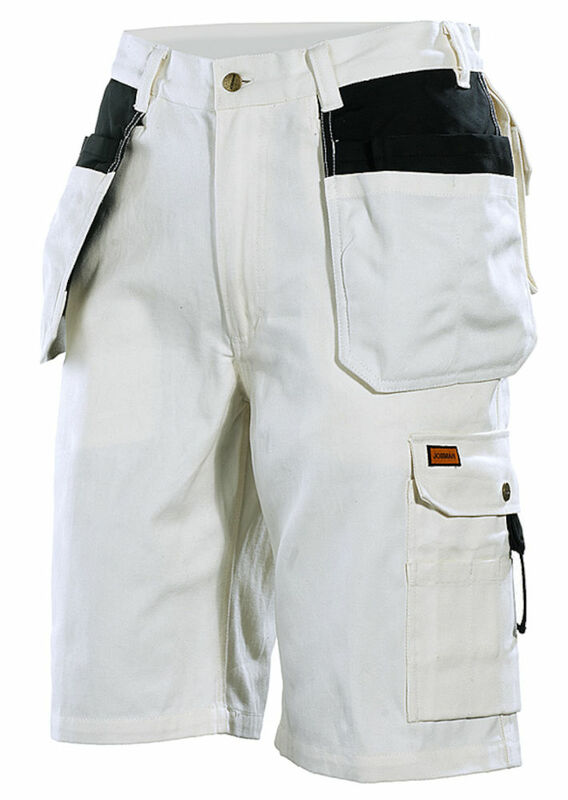 These shorts are made in tightly woven 100% cotton which maximizes absorption and minimizes paint running. Features include, reinforced holster pockets,hip pocket for phone, spacious holster pockets with extra compartments and inside reinforcement, inset front pockets that holster pockets tuck into, hammer loop, back pockets with reinforced inside, double putty knife pocket unattached at bottom edge with knife button, and leg pocket with phone compartment. Best shorts ever, until you wash them. These are the best short I have ever owned since I have been a painter(14 years). They hold everything you need when doing prep for interior or exterior work. Even perfect for doing finish carpentry. Just make sure to order a size bigger or two to allow for the shirinkage after washing them. I now look like I am the John Stockton of painting because they barely come to my knee.